Should I Be Worried If My Heart Skips Beats? 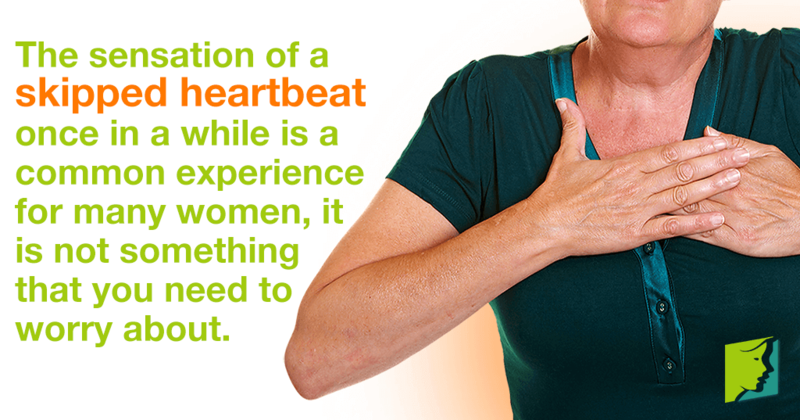 It can cause many women a great deal of concern if they begin feeling their heart skipping beats. However, in most cases this is nothing to worry about, and it is a common experience. Despite this, anyone with any concerns about their symptoms should seek the advice of their doctor. Continue reading to discover whether, and when, you should be concerned if your heart skips beats. What's Causing My Missed Heartbeat? Not every person who experiences a skipped heartbeat does so for the same reason. Anxiety, however, is one of the most common causes of a skipped heartbeat. However, other things, such as an imbalance of hormones, caffeine, alcohol, and stress, can all provoke a missed heartbeat. More serious causes of a skipped beat are heart problems or low potassium levels. If you are unsure about the cause of your skipped heartbeat, or you believe it is related to an underlying problem that is not resolved by lifestyle changes, then seeking medical advice would be a good idea. What Type of Irregular Heartbeat Do I have? There are different types of irregular heartbeats that you might consider to be a missed beat. Missed beats, heart palpitations, and a thumping heart can all cause the person suffering to grow worried. However, in most cases, none of these irregular beats are anything to be worried about. Skipped heartbeats usually occur when your heart's regular rhythm is interrupted by a premature beat. This means the heart receives a signal to squeeze before it has totally filled with blood, which is the feeling of a missed beat. Most of the time this is not dangerous, and the majority of people have experienced this sensation at some stage of their life. However, if you begin to experience a skipped beat on a regular basis, or if you have underlying health factors, it would be advisable to make an appointment with your doctor. The sensation of a skipped heartbeat once in a while is a common experience for many women, and it is not usually something that you need to worry about. A missed heartbeat can be a strange sensation, but panicking is not necessary. A missed heartbeat will usually correct itself after a few moments, but if you have any worries about your heartbeat, or have any underlying conditions that might put you at further risk, then you should consult your medical practitioner. Find out the six best natural ways to cure irregular heartbeats during menopause in order to be on your way to optimal cardiovascular health.